This is the second week in The Sunday School Zone Buildup To Easter and falls during the week beginning on Sunday, March 10, 2019. The story of Cain and Abel reveals that evil is growing and having an impact that goes beyond Adam and Eve both in its reach and also in its intensity. The sin committed by Adam and Eve in the garden may seem small, but evil is now growing and it’s growing rapidly. Within just one generation, sin has progressed to the murder of a sibling. Adam and Eve ate the fruit in the naive belief that “it was desirable for obtaining wisdom” (Gen. 3:6). It hasn’t turned out that way. Such is the power and intensity of evil. We sometimes prefer not to think about sin and evil. But ignoring the power of evil isn’t healthy. 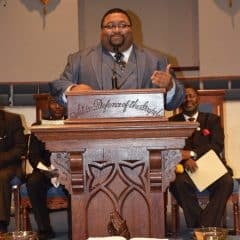 The story of the Fall and the story of Cain and Abel (not to mention Noah and the Tower of Babel) are carefully placed at the beginning of the biblical story precisely so we would understand what the rest of the story is about… Evil is destroying God’s good creation, including people, but God has a plan to fix the problem. When we minimize the seriousness of evil by ignoring it, we also minimize God’s solution to the problem. Evil is so great that it will require the sacrifice of God’s own Son. Nothing less will do. Further, it’s now apparent that evil is in us. It’s not a distant threat from which we can run or hide. Evil is real. Evil is serious. And evil is within us. We can’t deal with evil on our own. It will require God to act on our behalf and that is exactly what He will do. We need God to do something about evil in our world and in our lives. The stories found in the early chapters of the Bible (Gen. 1–11) tell us that God has a plan and He is acting within history to bring His plan to fruition. Jesus is the solution to the problem. Jesus is at the heart of God’s plan to destroy evil and restore creation. Jesus’ crucifixion will accomplish victory over evil. His victory, however, will be underestimated and minimized if we don’t understand just how powerful, catastrophic, and pervasive evil is. Evil is the enemy and it is in us. 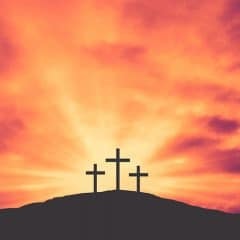 Only Jesus and what He accomplished on the cross can conquer it. This is an important truth that all of us, including children, need to understand as much as possible. As adults, we should have no trouble grasping this truth. Children will need to grow into an appropriate understanding of this reality. Parents and teachers can help them, however, by not minimizing the reality and presence of sin in all of our lives, including the lives of our children. Like Cain (and Adam and Eve before him), we have an inclination toward self-gratification and the sin that comes from it. The better we understand the power of sin within us, the better we will understand the work that Jesus accomplished on the cross. The story of Cain and Abel can help adults and children gain a better understanding of this reality. You can find a number of free, printable activities related to Cain and Abel on the site. Encouraging kids to study this story during the Easter season can help them place the crucifixion and resurrection in its larger biblical context. Other activities and resources related to Easter can also be found on the site. 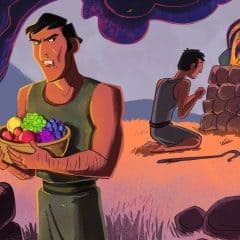 This has been the week of Sunday, March 10: Cain and Abel for The Sunday School Zone Buildup To Easter. To see all weeks, go here.